Depressing though it is, the recession has brought some unexpected benefits for Britain's food lovers. With commercial property prices dropping, independent restaurateurs and producers find they can now afford premises, and young cooks have been trying themselves out in projects with low entry costs – pop-ups and street food, for example – but some are exploring a new direction. There has been a noticeable movement of food lovers researching complicated processes, building their own equipment and even developing businesses fuelled by little more than enthusiasm and ingenuity. It runs in parallel with a rising interest in traditional crafts, with a swelling, almost political desire to cut food businesses out of the food chain. It's geeky, obsessive, web-driven and, above all, fun – this is the new Food DIY. Jack Harrison is a 51-year-old career chef with six children and the look of a man who has stood at enough ranges. When his last business, a critically acclaimed gastropub in rural Leicestershire, went to the wall, he began casting around for a life change. "I got interested in wood ovens on a holiday in Switzerland and thought I'd build one at home for parties but couldn't find a place to put it. Then one day I was driving down the M6 behind a horse trailer and I thought, 'Why not build one in that?'" A good wood-fired pizza oven runs at temperatures around 400C, can sear a pizza into crisp perfection in 90 seconds and is massively built using bulky materials to store the heat. 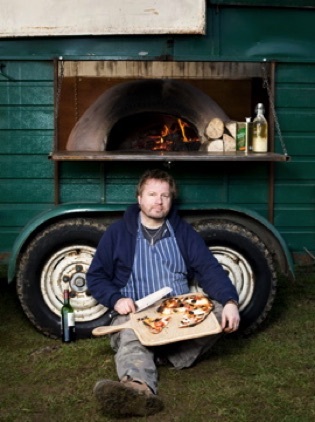 Harrison had never built one before but the internet is awash with drawings, plans and blogs from enthusiasts who have built bread or pizza ovens in their gardens. "I researched oven construction, materials, thermal mass," he says. He discovered the techniques of shaping and moulding the cooking chamber over a tonne of building sand sculpted into a mound. From his home near Melton Mowbray he travelled the country in search of arcane materials such as fireproof cement. Harrison initially took the trailer to farmers' markets around the Midlands because, he says, "no one else was doing anything like it". His pizzas, which would taste fantastic in a posh urban pizzeria, are a sensation in a raid-sodden field and people began asking to book him for weddings, birthdays and other events. "Wherever I go," he says, people are fascinated by the oven and now people are asking me to build them." This year he'll be working on his first commissions to design and build ovens in customers' gardens. "I never felt that restaurants were my calling – though I was quite good at it. I kept getting out of the business but it drew me back in. I'm so happy I've gone in this direction. It's taken on a life of its own – kind of pulling itself along now without me having to push it."